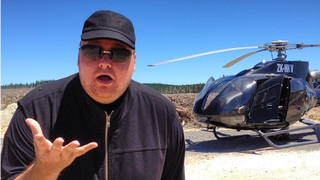 Kim Dotcom is a character. Giving the finger to the government that took his site down by setting up a new one. Throwing a press conference complete with a fake FBI raid, pyrotechnics, and dancers. Demolishing cheap lawn furniture. Now, thanks to helicopter problems, he's stranded in the middle of nowhere. Ever the showman, he's making something of an event of it. We hope you get out of there, dude. But in the meantime, we're glad you're having fun.